The Register-Guard: The University of Oregon purchased the collected papers of novelist Ken Kesey and will make them available for academics and research. California Science and Technology News: UO geologist Ilya N. Bindeman finds that another super-eruption from the still-alive Yellowstone volcanic field is less likely for the next few million years than previously thought. KEZI-TV: UO Health Center leaders say they hope the app helps students make healthy sexual decisions. KVAL-TV: The Northwest Scholastic Press Association and the UO School of Journalism invited young journalists to campus with the opportunity to improve their craft in a daylong event. AroundtheO: Sponsored by the office for Research, Innovation and Graduate Education, the Research Faculty Breakfast is part of October Research Month. 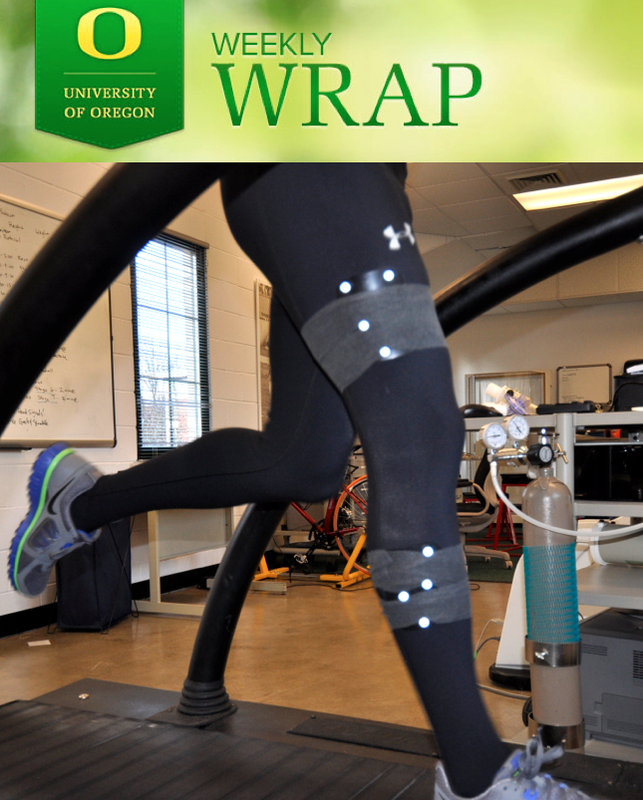 Oregon Research: The Bowerman Sports Science Clinic will be open for walk-through tours and live demonstrations of the biomechanical analysis equipment. UO Alumni Association: Homecoming events include reunions, pep rally and parade. Oregon Law: Dave Frohnmayer, University of Oregon president emeritus and law professor, has been named to the board of directors for the American Academy of Arts & Sciences. AroundtheO: World-renowned sitar virtuoso Kartik Seshadri will demonstrate his instrument and the playing style of Indian classical music to students on October 18 at 2 p.m. The Register-Guard: Tom Heinonen is headed to the UO Hall of Fame after coaching track for 28 years. The inductees will be honored this weekend. Oregonian: The Ducks will take the field on Saturday wearing uniforms to honor cancer survivors and help raise money for the fight against women's cancers.